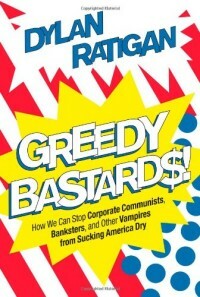 "Greedy Bastards: How We Can Stop Corporate Communists, Banksters, and Other Vampires from Sucking America Dry" is a rant with policy undertones by a mad-as-hell Dylan Ratigan. Ratigan, host of MSNBC's The Dylan Ratigan Show, is infuriated by government corruption and corporate communism, incensed by "banksters" shaking down taxpayers, and despairing of an ailing health care system, an age-old dependency on foreign oil, and a failing educational system, Ratigan sees an America that has allowed itself to be swindled and robbed and offers some brash and fresh solutions for building a new and better America. Among other dysfunctions, he targets a political system in which lobbyists write legislation, lawmakers place “secret holds” to create more pork for their districts, and money drives the whole process; a banking system that uses capital for speculation and debt creation, rather than productive investment; a health care system that is among the priciest and least sustainable in the industrialized world and an educational system that prizes prestige but produces mediocrity. Dylan Ratigan is the host of MSNBC's The Dylan Ratigan Show, an opinion-fueled daily broadcast program, and the podcast Radio Free Dylan. The creator of CNBC's Fast Money and formerly the co-anchor of CNBC's The Call and Closing Bell, Ratigan started his career in print journalism and rose to become the global managing editor for corporate finance at Bloomberg. He has worked as a regular on-air contributor for ABC News and published articles in newspapers and magazines including the New York Times, Washington Post, Miami Herald, Chicago Tribune, and the Huffington Post. His coverage of the Enron scandal at CNBC earned him journalism's coveted Gerald Loeb Award. Using the mantra "The truth will set you free; but first it will piss you off", Ratigan focuses on solutions to our nation's largest problems while holding the government accountable for its role in solving them.